Following up on my talk at the National Hombrewers Conference (audio and slides will be available here for AHA members), I want to take some of the new info I presented in the talk and expand on my previous grisette posts (What is Grisette and a Grisette Recipe). So I'm starting a new series of posts diving into various aspects of historical grisette production. For those that didn't make it to the talk, these posts will cover a good amount of what was there. And for those who made the talk, these posts will hopefully add some new info to what I presented, or at least give a good platform for discussion of the topics with a different organization. To start this all off I'll talk about hopping grisettes. When it comes to the specifics here (hopping rates) I only have one good source: Pelset’s 1874 text on brewing grisettes and pale beers. It is always risky to draw large historical generalizations from a few sources, and that is the case with grisette as a whole given what I’ve been able to find. And it is especially true here for hops. So for now this is the best I can do, and we’ll just need to keep those caveats in mind. The info will be updated if I am able to find more sources. Before getting into grisette specifically I want to spend a bit of time talking about hops in general. 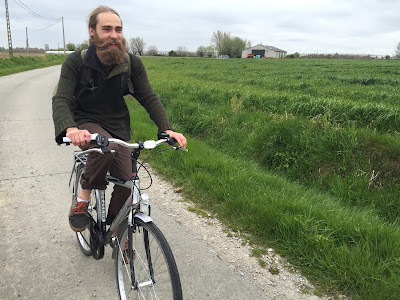 Within Belgium, the two main hop growing regions were, and still are, around the West Flanders town of Poperinge (quite close to Westvleteren and also the French Border) and the East Flanders town of Aalst (which falls rather close to the Pajottenland in Flemish Brabant). These hops were regarded as being of higher quality than Belgian hops grown in other regions, but generally Belgian hops were thought of as inferior to hops grown elsewhere in continental Europe and in England. Multiple recommendations are made in Le Petit Journal du Brasseur for brewing saisons and bières de garde with English (the East Kent region shows up multiple times) and Bohemian hops. (Note that bière de garde here refers to general beers for aging and not the family of beers known by this name in Nothern France.) The journal suggests these hops for their superior flavor contributions and less aggressive bitterness. Bavarian hops were well regarded also but were thought to give more antiseptic properties and a stronger bitterness, which may not have been desirable in all beers. Especially those which the brewer wanted to become acidic. These trends may reflect some inherent differences in the varieties of hops, but I suspect much of the difference is strongly influenced by the quality of the hops in terms of cultivation rather than/in addition to differences inherent in the varieties. In the 1800s and early 1900s, popular Belgian hop varieties included Coigneau, Groene Belle, and Witte Rank. Coigneau (as I've talked about before) is notable as being a main hop used in lambic production. And from what I’ve gathered it seems to have been the main Belgian hop in the late 1800s. In the early 1900s Groene Belle seems to have supplanted Coigneau as the primary hop of choice. Native Belgian varieties disappeared around the mid-1900s as Belgian hop growing switched to other varieties such as English hops, which are common today in Belgium’s hop fields. These original Belgian hops were very nearly lost forever, but fortunately some Coigneau was recently discovered as having made its way to an English nursery. Groene Belle was used in hop breeding in Slovenia and was also able to survive until today. Both of these varieties are potentially available for purchase in season as plants from a UK supplier. It seems that they are not shipping outside of the UK for now, but perhaps that could change with enough enthusiasm/nagging. But if you really want them you may have to make some UK friends. Whatever the case, it is good news for those interested in historic Belgian beers that these hops somehow found ways to stay alive until modern times and hopefully the availability of plants and/or hops increases. Pelset gives hopping rates which would depend on the season of brewing and the type of grisette brewed. Before going further, as mentioned in Brewing with Wheat, Pelset describes 3 classes of grisette: Young/Ordinary Grisette, Grisette de Saison, and Grisette Supérieure/Double Grisette. I may go into more detail summarizing these beers at a later date, but for now here's a quick rundown as it pertains to hops: ordinary grisettes brewed in summer would have been hoppier and also slightly stronger than those brewed in winter to counteract the non-ideal summer conditions. Grisette de saison, brewed ‘in season’ so in the wintertime, would have been stronger and hoppier than both summer and winter young grisette. Not many details are given for grisette supérieure, but this would have been stronger still, and presumably more hoppy as well. I’ve transcribed the specific hopping rates suggested for grisette by Pelset into the table below. For comparison I have also included some info from various issues of Le Petit Journal du Brasseur for saison and bière de garde along with relevant notes about those recipes and calculations I made. Pelset notes that Wallonian hops, or hops from other areas of not optimal quality, can be added as first wort hops while Poperinge or Aalst hops should not be boiled for more than 2 hours in order to not extract too much bitterness. Using a small amount of Poperinge or Aalst hops as first wort hops would be permissible. Non-Belgian hops are recommended for grisette supérieure given its higher quality and price point (more on grisette pricing in a post to come). Other texts from the early 1900s give a rough conversion of 1.5 lbs Belgian (Poperinge or Aalst) hops to 1 lb Bavarian hops. I should note for this table that the exact timings for hop additions aren't always given, but that these hopping rates are for what seems to be bittering hops. 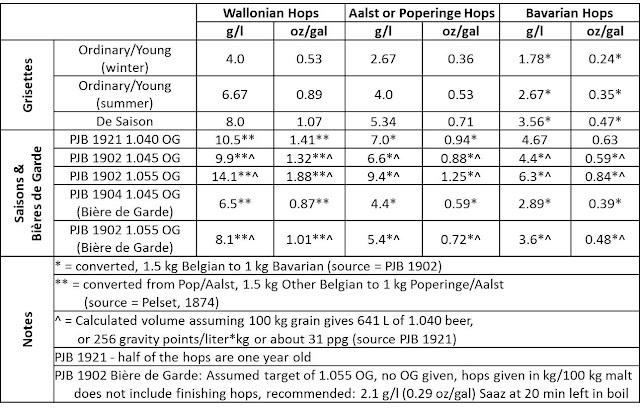 Hopping rates for different grisettes and saisons/bières de garde in the late 1800s and early 1900s. Le Petit Journal du Brasseur recommends dry hopping grisette with English hops. Bavarian hops are mentioned as being too bitter. Specific hopping rates aren’t given, but are likely low (lower than what it sounds like was done for saison at the time). From this I am guessing that dry hopping rates would have been on the order of 0.5-1 g/l (0.066-0.13 oz/gal), though with everything else here there is not one approach that would have fit everything, so higher or lower rates might also be appropriate. From what I’ve seen, most grisettes would generally have been consumed young and, save for one mention in one source I’ve found, grisette was never described as a tart or acidic beer. That one source is definitely in the minority, with most others referencing the refreshing hoppyness as the character of note. The higher category grisettes (grisette de saison and grisette supérieure) got some aging time, but overall descriptions are consistent with these hopping rates and the time between brewing and serving of most grisettes resulting in a hoppy beer where the mixed-microbes used in fermentation would not have had a chance to express much acidity in the beer. This leaves grisette as a beer without a lot of mixed-microbe character and with some brighter hop character still around. It is important to note in closing that all of these hopping rates are for historic beers with historic hops. We don't know exactly what those hops would have been like, but they were probably lower in alpha acid than modern hops, especially the Belgian hops. They may have contributed a bit more of a rough bitterness given the amount of plant material used and the long boils. And, in looking at the table, the origin of the hops can have a big impact on the total recommended hopping rate. Ok, that roughly sums up the additional thoughts on grisette hopping for now. Hopefully this was useful for you and keep an eye out for additional posts breaking down specific aspects of grisette.